Rob qualified as a physiotherapist in January 2015 and joins the team with 20 year’s experience of working in professional sport. 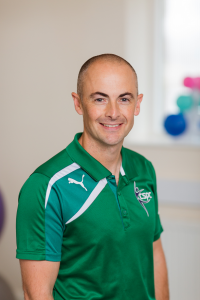 He is a fully qualified PGA golf professional; following completion of a BSc Sport & Exercise Science degree, he began providing sport science support to professional golfers on the European and Challenge Tours. This work focuses on the use of sport science tools to objectively measure performance and help inform the design of specific strength and conditioning programs. Rob qualified with an MSc in Physiotherapy from the University of York St. John and is looking forward to working with a range of clients from all different backgrounds at CSPC to unlock the benefits that physiotherapy can bring in terms of injury prevention, treatment and rehabilitation. Rob is particularly passionate about working with the sport performer, coach and other members of the team in order to achieve and maintain peak performance. Aside from his work at the Coach House Sports Physiotherapy Clinic Rob runs his Peak Golf Performance business and you can read more about what he does here. He also works on the professional golf tours and provides physiotherapy within football for the Leeds United Academy teams. In his spare time Rob is keen to practice what he preaches in the gym and enjoys road cycling. However recent studies and the birth of his baby daughter mean he has had less free time to indulge in these activities!